​I've often laughed it off or kidded myself in to thinking that because I do lots of active sports I must be fit. The truth is that I was desperately unfit and close to breaking point. I turned 35 and felt about as bad as I have done in years. I'd look at my two children, Emily and Charlie and would think to myself "what sort of role model am I?" I don't want my kids to grow up thinking that takeaways, beer and chocolate are the only things in life worth looking forward to. So to cut a long story short I decided enough was enough. I had already heard good things about LS Personal Training so I made without doubt the hardest but most important phone call of my life and called them. I initially spoke to Clare Slinn, and although I was still trying my hardest to convince myself that I didn't need help and that it would be a waste of time Clare took the time to understand where my head was and explained that they could give me the help, support and guidance I was desperately in need of. My first session at the gym with Les was an easy going fitness assessment, it was fun and I was made to feel immediately at ease. I weighed in just short of 19 stone, with worryingly high blood pressure. My fitness test results were less than impressive with several references to terms such as "clinically obese" scattered throughout it. Les had identified a real health risk in me and I was referred to my GP for a more thorough check of my blood pressure. This in itself was a bit of a shock and being a typical bloke I wasn't overly familiar with the inside of a doctor's surgery so it was all a little overwhelming. Having had my blood pressure checked by the GP it was clear urgent action was required and with the GP satisfied I was in good hands with Les I was given the all clear to start training. So in late July 2012 I started to visit Les on a weekly basis. My first few sessions were really hard work but I never felt as if I was being judged or asked to do things that I was uncomfortable with. Although hard the sessions were really good fun and rewarding. I remember my second visit to see Les and my first real weigh in since starting my healthy lifestyle change. I have to admit I was nervous and I really didn't know what to expect. To my amazement I lost 4lbs. But what struck me most was how pleased Les seemed about it; of course I was pleased but Les seemed genuinely excited, almost like he was expecting it to have happened. From then on I was determined to have that same feeling every week. Les created a tailored excercise plan for me and I signed up to a local gym. After a few weeks of gentle jogging for a couple of minutes coupled with a bit of brisk walking on the tread mill I really started to think I could achieve more so I kept pushing each time I went to the gym. A few more minutes soon turned in to half an hour. With more advice and some early morning jogs with Les I soon progressed to running outside. Okay, it wasn't fast or pretty but I was outside running where only a few weeks before I could barely get up the stairs without feeling out of breath. My first real achievement was a three mile run in half an hour, it was hard but I remember I ran every step with a smile on my face. Week after week I managed to shift a few pounds through nothing more than exercise and eating healthily. I dramatically cut back on the booze, vowed to drive past rather through McDonalds and set about religiously ensuring I had a healthy breakfast before I left for work. I just made subtle changes to my diet, and took to eating earlier in the evening. I found that when I got hungry I drank water, in fact in the early weeks I couldn't be separated from my water bottle. Drinking takes the edge of hunger and has the added benefit of keeping you well hydrated. 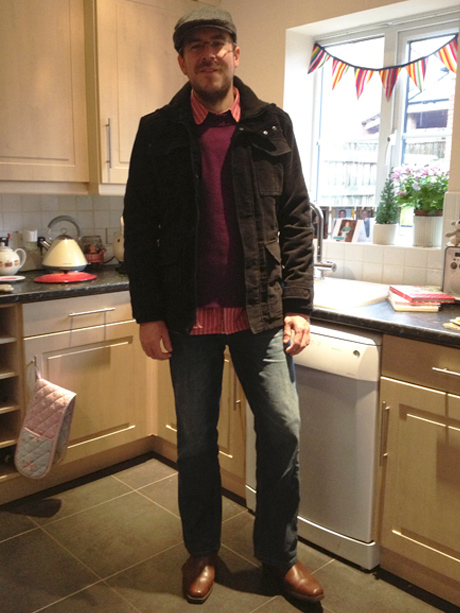 2013, new me, new wardrobe!Within two months I had lost just under two stone. I decided I'd give myself a personal goal so I signed up to run a charity 10K in December. I started running more outside and found my distance and times got quicker. The weight started to shift quicker as well. Within three months I had lost about three stone, and although the weekly loss started to slow down I was consistently losing two or three pounds a week. By December I had lost four stone and by Christmas I had gone from 18stone 10lbs to 14 stone 5lbs. In December I raised £230 pounds for Great Ormond Street Children's Hospital by running a 10K race dressed in a Santa Suit. I made it round in 52 minutes and crossing the finishing line was one of the proudest moments of my life. So much so that when I got home I signed up to run the Reading Half Marathon. I'm now running 14 miles when I go out usually I still have the same smile on my face. My blood pressure is now normal, I have tons more energy and now I actually feel good about myself. People don't recognise me, and in truth I don't recognise myself sometimes. Photographs from just six months ago don't look like me, and I have to have a double take when I walk past a mirror. But the best thing by far is that I can look Emily and Charlie in the eye and know that if I keep looking after myself I will be the active father they deserve, someone who can go to the park, ride bikes, play football and be what all good Dad's should be, a positive role model. And how do I know that I will do this? Well that's simple, what Les and Clare have done for me is to change my life, of course it's down to you to put the work in but with their support and enthusiasm the only reason you can fail is if you want to! Diets are short lived but with the help of LS Personal Training the life style you crave is within arm's reach, all you've got to do is to reach out and grab it. Mat Henderson - January 2013.